The broad goal of the Taiwan-USA scholarship is to create friendships between American and Taiwanese students. 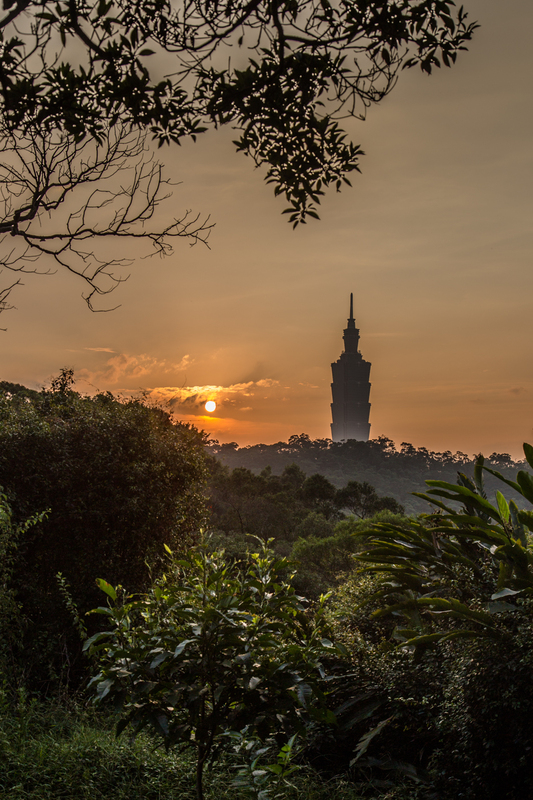 However, our weekly routine involves both rigorous Chinese study at National Cheng Kung University and oftentimes weekend excursions to destinations such as Taipei, a Buddhist Monastery, or host family. Wei from my hostel advised me to try shrimp rice. It was ‘delicious’ and a street nearby (保安路was famous for having tasty bowls of it. I was in, despite never tasting the dish and not knowing whether it was shrimp flavored rice, shrimp fried rice, or perhaps even rice cooked by shrimp [just kidding]. 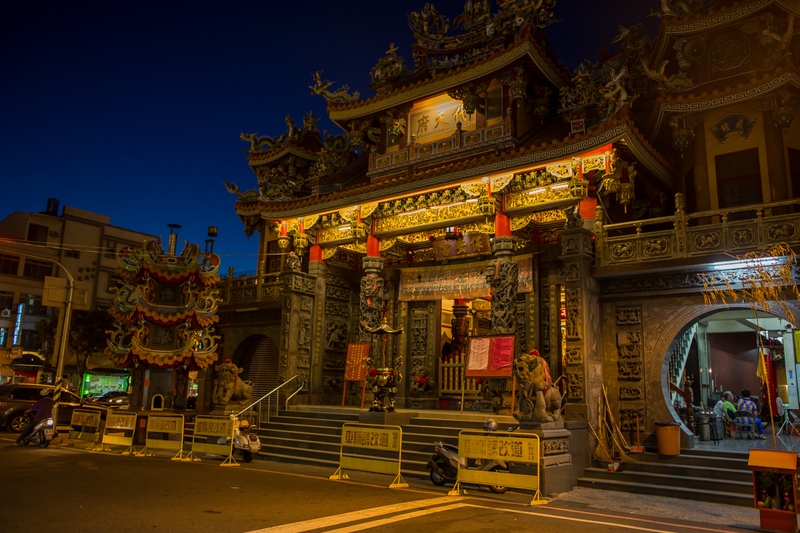 One of the most interesting aspects of life in Tainan is its presence as the ancient capital. Temples and shrines are everywhere; I didn’t plan to see Daitian Temple but by chance walked by it near sunset. Sunset would take place in less than an hour. I had to head east and climb. I knew where the mountain was, but not where the trail began. I set off with no snacks, no water, and only a vague sense of direction. It was 90 degrees outside. While that may not seem too terrible, with the heat index it was 105. After spending the morning outside at the dragonboat races, I loaded my handy TripAdvisor app, checked out the best attractions nearby, and headed to Martyrs’ Shrine three kilometers away. Built in the style of Beijing’s Hall of Supreme Harmony, Martyrs’ Shrine is dedicated to the 390,000+ citizens who sacrificed their lives, particularly in the Sino-Japanese war and the Chinese civil war. 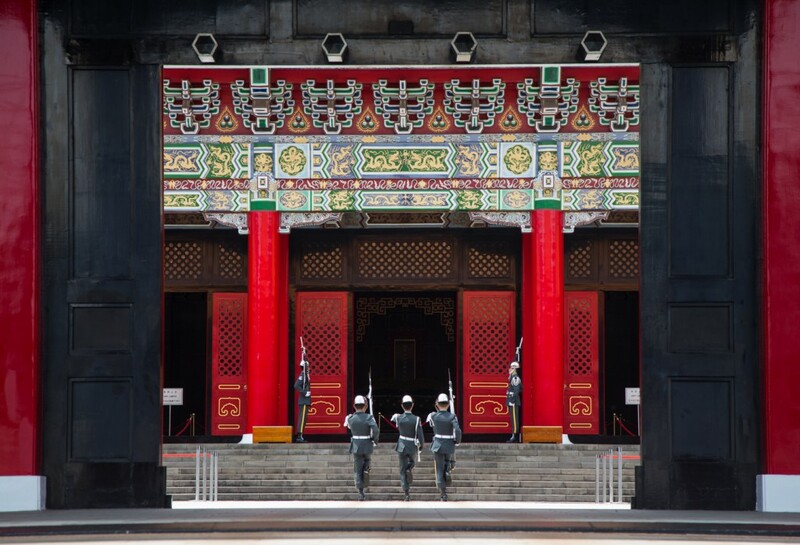 Two military soldiers guard the shrine’s entrance, while two others guard the main gate. 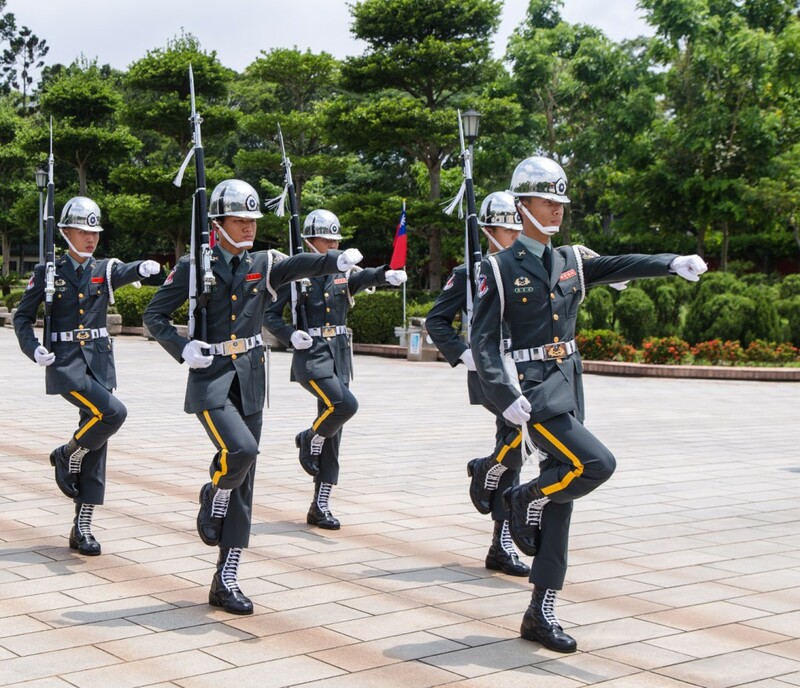 These soldiers stand motionless for an hour at a time; sweat puddles on the ground beneath them. Every hour on the hour they hold the changing of the guards ceremony. While similar to Buckingham Palace, it almost seemed more rigid and tense – not to mention their lack of bearskin hats. 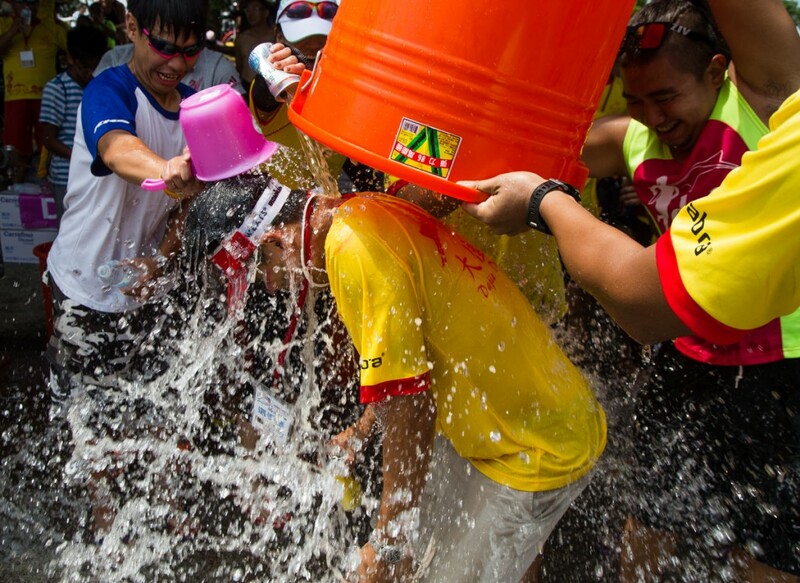 The Dragonboat Festival was almost reminiscent of a carnival. 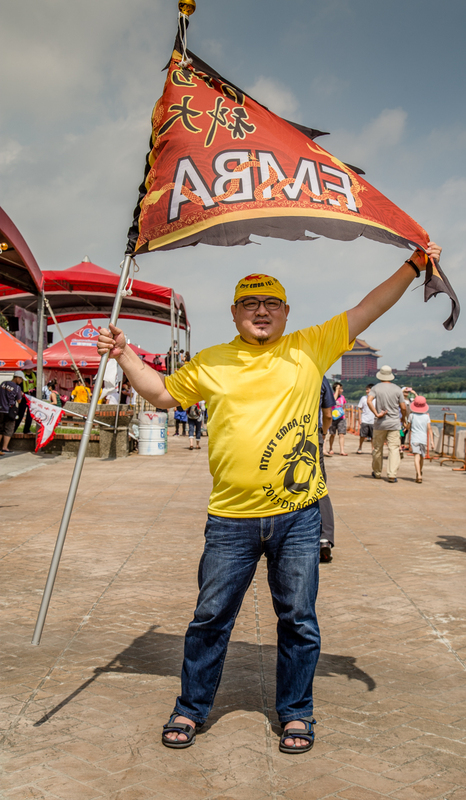 Along the river, teams gave away pyramid-shaped dumplings (粽子) and water bottles. Towards the park, shops and kiosks gave away everything from Dragonboat Festival FAQ brochures to free shampoo (which had a line over 50 people deep!) Children played by the river; teenagers took selfies with the walking sunscreen bottles. While watermelon juice and and grilled sausages were high in demand, I found the cotton candy for sale to be especially enticing. It was made on-demand, and had the look of a chicken with seaweed eyes and Nicki Minaj inspired lips. 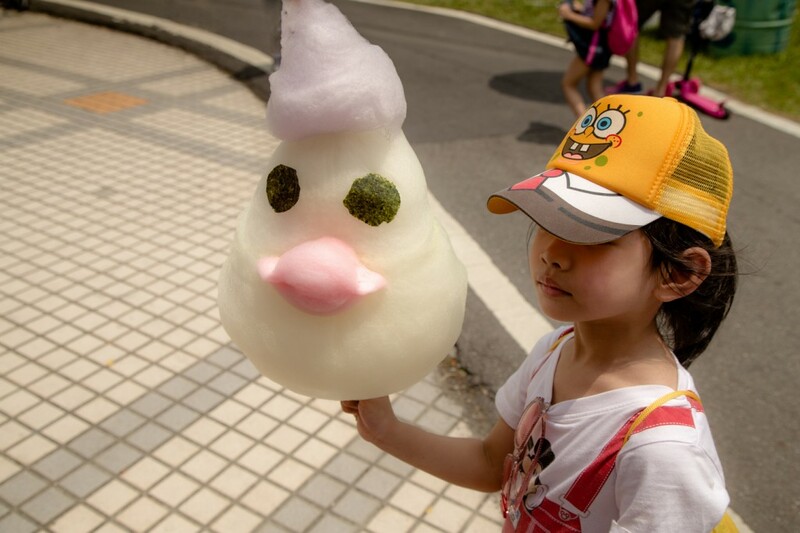 I asked a young girl’s mom if I could take a photo of her daughter with the cotton candy, and she gladly agreed. While the mom tried to get her daughter to look at the camera, her eyes never left the prize. 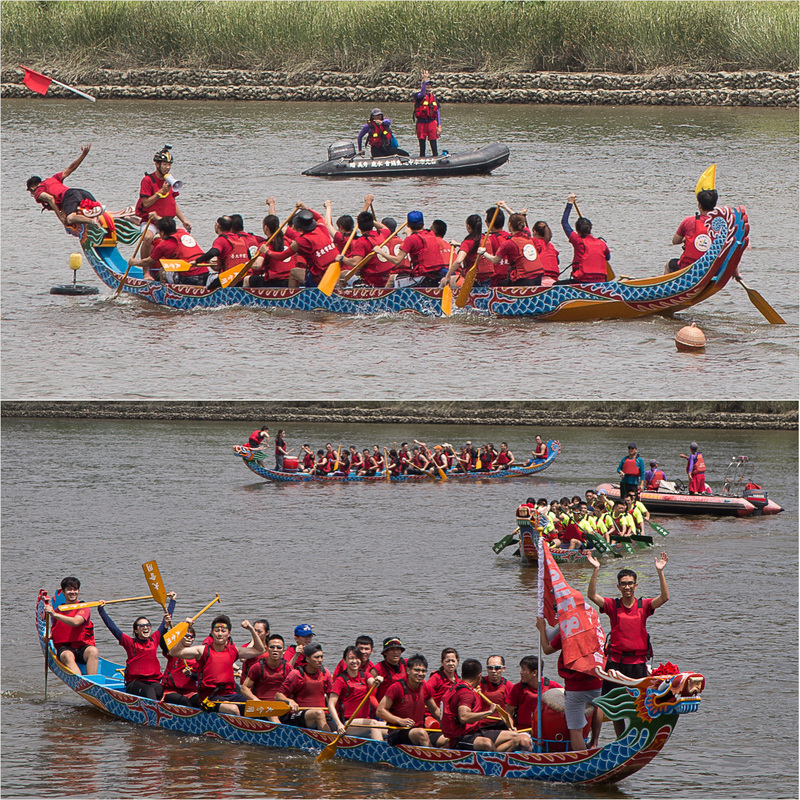 Dragonboat Festival (端午節) took place last weekend, and I arrived in Taipei just in time to catch the festivities. 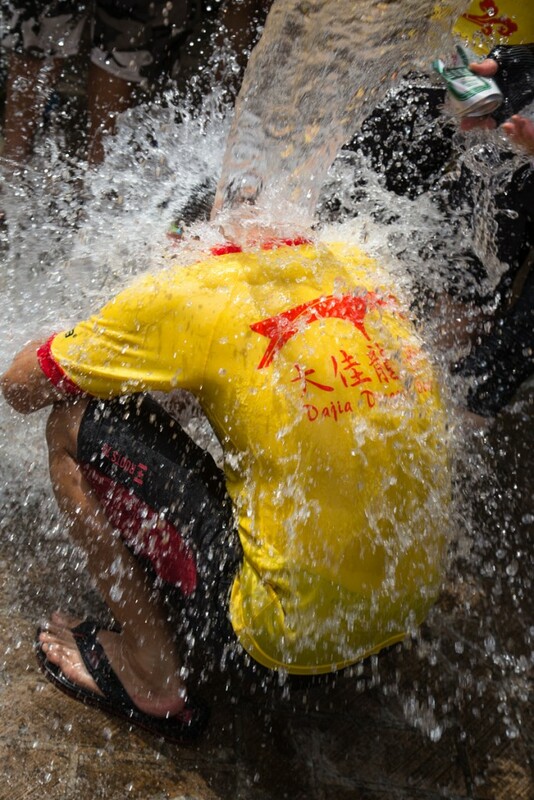 This festival takes place beginning on 農曆五月五號, 5/5 on the Chinese lunar calendar. 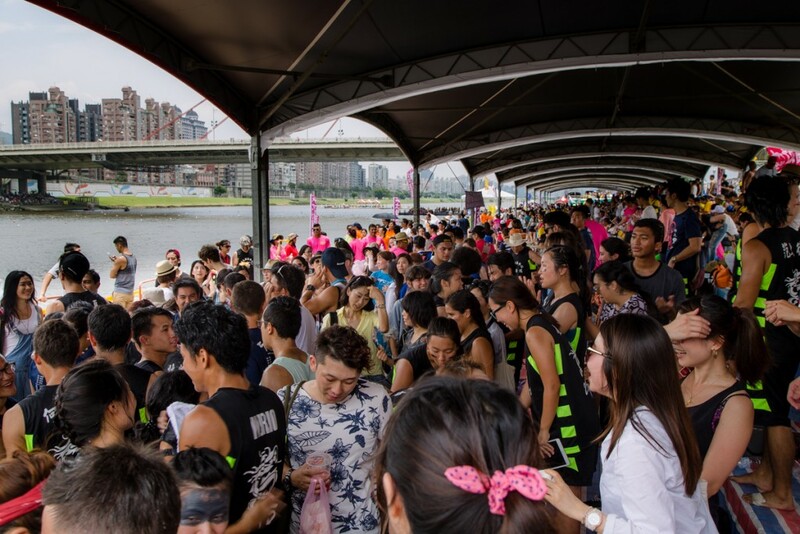 Thousands lined up at Dajia Riverside park to catch the races and enjoy a day out. Dragonboat Festival is said to originate following the death of Chu royal house poet and minister Qu Yuan. Qu opposed the state’s alliance with the Qin dynasty and was banished from the state. 28 years later when the Qin Dynasty captured the Chu capital city, Qu drowned himself in a river. The locals raced out in dragon boats attempting to save him or retrieve his body. 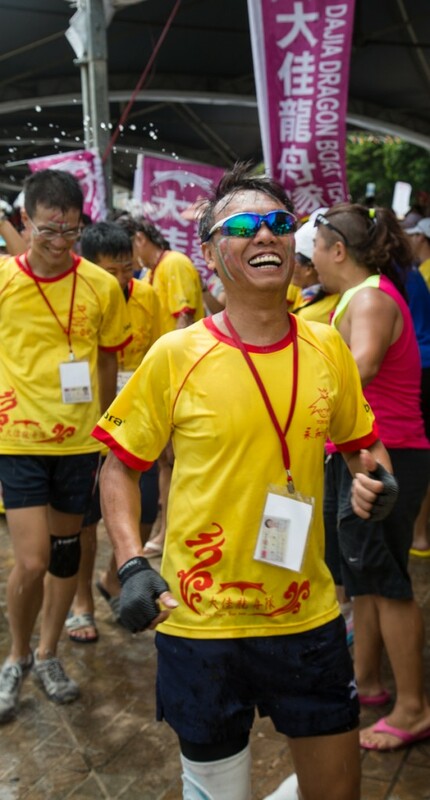 Each race is a 500 meter sprint, and there were over 100 races on Saturday alone. Some were blow-out victories, while others were close and intense. The diehard supporters waved flags as they clapped and sung their team to victory. Several teams preparing to race practiced in-formation on the concrete. 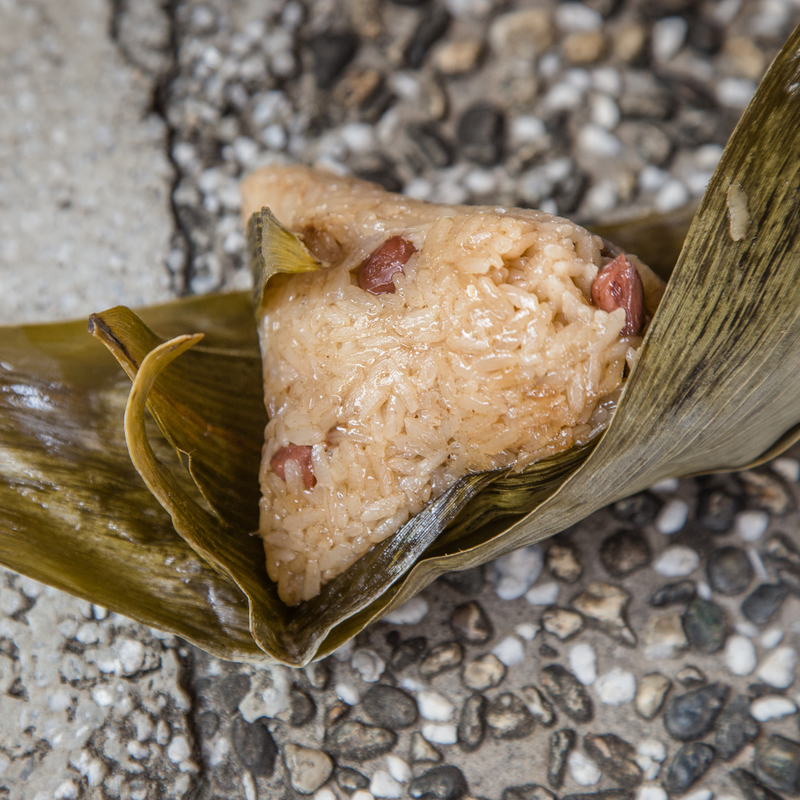 Zongzi (粽子) are the traditional food eaten on Dragonboat Festival. Supposedly when Qu’s body could not be found in the river, the locals threw these in the water so that the fish would eat them instead of his body. Zongzi are glutinous rice dumplings with a meat/mushroom center, wrapped in bamboo leaves and steamed. Quite tasty. The end of most races was the 500 meter finish line. In others, the victor was determined by who could reach the finish line and throw the colored flag into the air. The victors marched back to their supporters as champions. The best part of the day was watching the pandemonium that followed suit. I’m extremely excited to have received a scholarship to be a student ambassador in Taiwan this summer! I will be gone from June to late August and look forward to sharing my experience living in Tainan, Taiwan’s the food and cultural capital. Following are some of the most common questions I’ve been getting about my upcoming study abroad experience. 1. 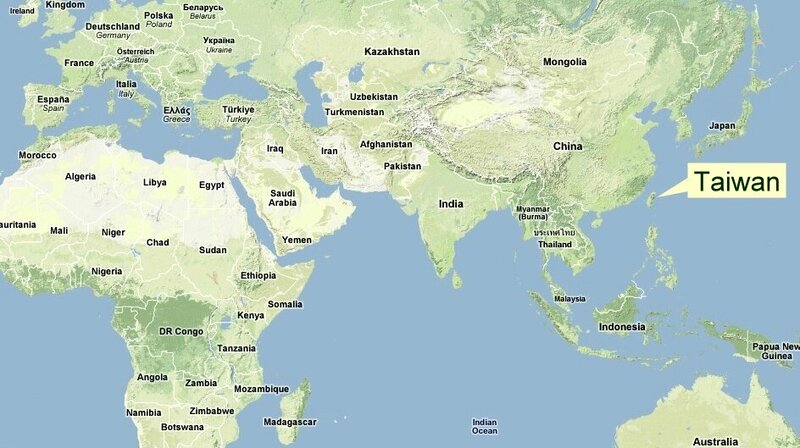 Where on earth is Taiwan? Taiwan is a small island located off of China’s southeast coast. 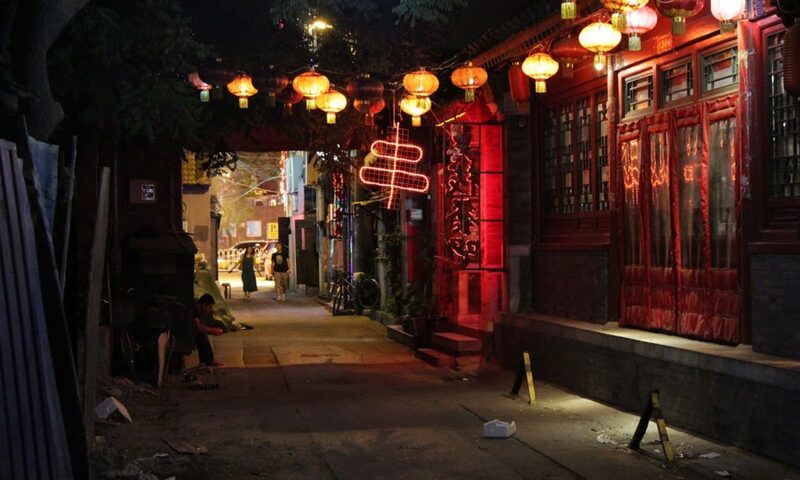 I’ll be staying in Tainan, often regarded as the food and culture capital of the island. 2. What’s the point of the scholarship? 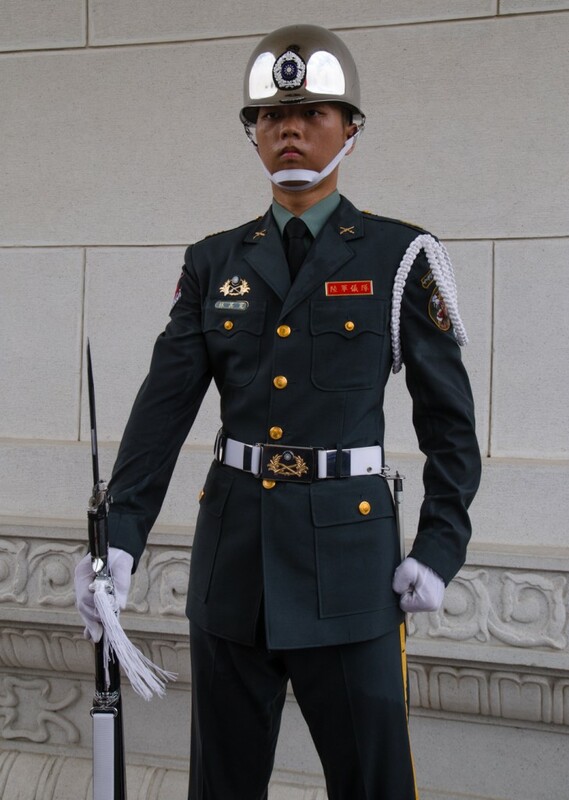 Students serve as ambassadors to promote peace by establishing friendships and mutual understanding between the people of the United States and the people of Taiwan through cultural exchange and educational partnerships. These opportunities help people gain understanding, acquire knowledge and develop skills for living in a globally interdependent and culturally diverse world. 3. That sounds fancy. What exactly will you be doing there? 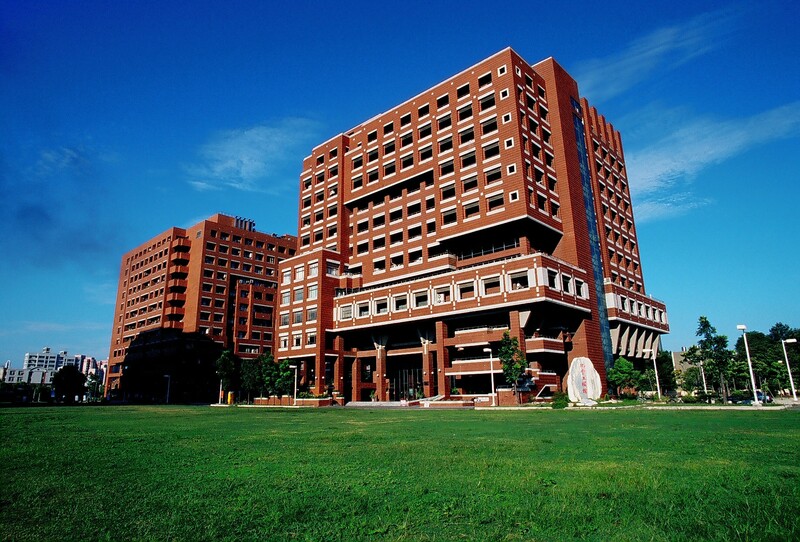 I’ll be attending National Cheng Kung University, one of Taiwan’s most prestigious universities. One of my main goals will be to work on my Mandarin language skills. Every day we will attend two hours of small-group language classes and one hour of 1-on-1 lessons. Time outside of class will be spent partly with my language partner and host family. In addition to language classes, TUSA students will take part in a variety of classes designed to concentrate on certain aspects of Chinese art and culture. These classes include a wide-range of subjects such as Tai Chi, calligraphy, Chinese painting, Chinese pop songs, stamp engraving, tea ceremonies, paper cutting classes, etc. I will also be using the resources at the NCKU library to continue work on my senior thesis project. Two things – Having the ability to immerse myself in Chinese and to try a new type of cuisine. The only Taiwanese snack I know personally is boba tea. 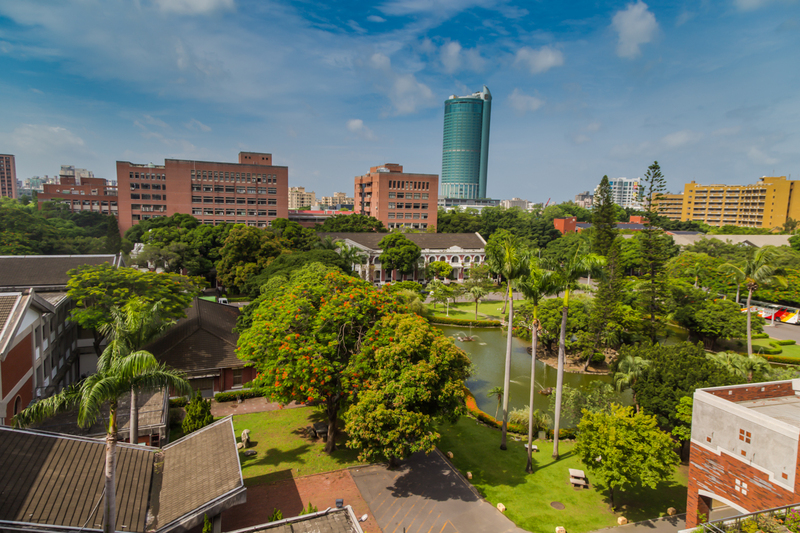 I’m stoked to be headquartered in Taiwan’s oldest city and the food capital, Tainan. Food writer Clarissa Wei recently got me excited for this summer experience with her CNN article titled, Around Taiwan’s Food Capital in 19 Dishes. 5. You’ve taken Mandarin classes for like over two years now. Are you fluent yet? 千里之行，始於足下 – A journey of a thousand miles begins with a single step. That’s my fancy way of saying not quite. I want to thank a number of groups and individuals for their support over the years. In particular, thank you to the individuals involved with the Naples Council on World Affairs, AFS/YES Abroad, the Taiwan-US Alliance, the Koleos family, and my awesome professors who were willing to help with the never-ending stream of letters of recommendations. I so look forward to this summer!